Adenocarcinoma prostate treated with hormone deprivation may evolve into a neuroendocrine differentiated tumor. Usually visceral metastasis are seen in neuroendocrine tumors. We present a case of neuroendocrine differentiated urethral metastasis from a hormone deprived prostate cancer. Urethral tumors, whether primary or metastatic, are rare. 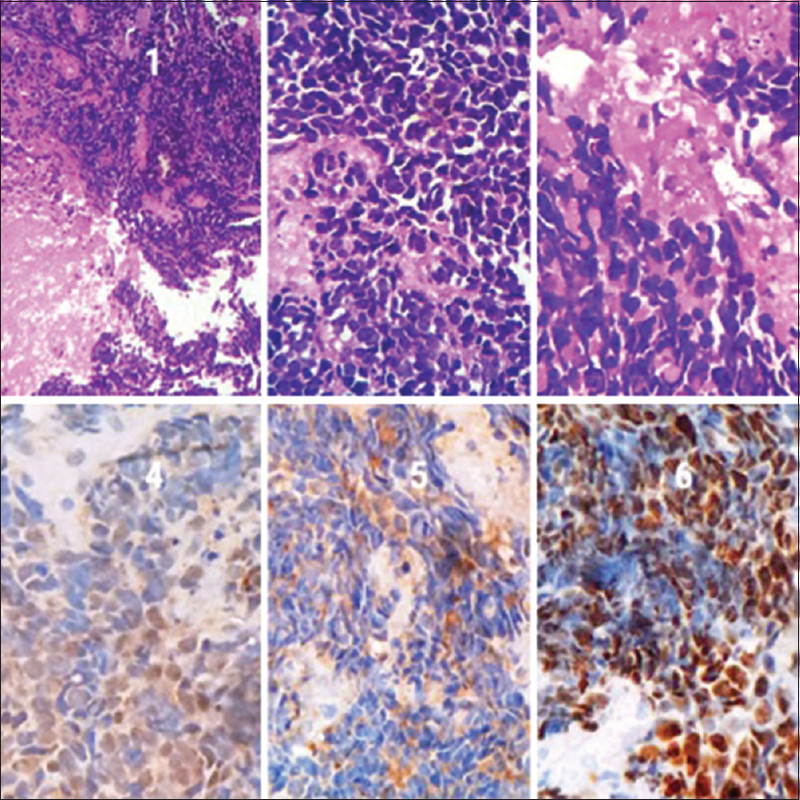 Immunohistochemistry markers are commonly required to confirm the diagnosis. Prostate cancer metastasizing to the urethra is rare and signals advanced disease. Adenocarcinoma prostate treated with hormone deprivation may evolve into a neuroendocrine, histology, a phenomenon called treatment-related neuroendocrine prostate cancer. Neuroendocrine prostate cancer has an aggressive progression with visceral metastasis and poor survival. Here, we present a case of neuroendocrine-differentiated urethral metastasis from a treated prostate cancer. A 72-year-old male patient was diagnosed with metastatic acinar adenocarcinoma of the prostate (Gleason score 4 + 3) with multiple bone metastasis in April 2014. At the time of the first diagnosis, his prostate-specific antigen (PSA) was 62 ng/dl. He underwent a bilateral orchidectomy, and the treatment with bicalutamide was started. From June 2014 to October 2015, his PSA ranged between 0.35 and 0.48. A follow-up contrast-enhanced computed tomography abdomen in January 2016 showed multiple mediastinal lymph nodes and a large, enhancing 4 cm × 3.7 cm metastatic lymph node between the gallbladder and pancreas, with thickening near the duodenal wall. An upper gastrointestinal endoscopic ultrasound-guided biopsy taken from the lymph node and the duodenum revealed a neuroendocrine tumor Grade 1. His PSA at the time was 1.71 ng/L. A magnetic resonance imaging (MRI) of the spine revealed diffuse metastasis in the visualized vertebrae with soft-tissue elements at the D11 vertebral body. He received external beam radiotherapy for the painful bone metastasis in January–February 2016. He then presented to us in January 2017 with poor flow, straining, perineal pain, frequency, urgency, and urgency incontinence. Urine culture was sterile. His uroflow was obstructive. Upper tracts were normal on ultrasonography, and his PVR was around 110 cc. A retrograde urethrogram revealed multiple irregularities along the wall of the anterior urethra [Figure 1]a. On urethrocystoscopy, there was a solid friable growth around 1 cm seen in the mid penile urethra [Figure 1]b. There were also multiple solid friable growths seen in the bulbar urethra with a soft short segment stricture in the proximal bulb. We did an optical internal urethrotomy for the short segment stricture and took multiple cold-cup biopsies from the mid penile and bulbar lesions. The first microscopic examination revealed carcinoma cells with dense nuclear chromatin, indistinct nucleoli, and scant cytoplasm, suggesting a poorly differentiated carcinoma [Figure 2]. Immunohistochemistry markers were then applied. CK7, PSA, chromogranin, CD56, CK20, and P63 were negative. The cells stained positive for synaptophysin and neuron-specific enolase confirming a neuroendocrine differentiation. He then received six cycles of carboplatin plus etoposide over the next 4 months. In August 2017, he received a few sessions of stereotactic radiation to the brain for newly diagnosed brain metastasis. In November 2017, he had increasing pain in the perineal region. An MRI of the pelvis revealed local advancement of the prostate mass into the pelvic floor muscles. He was given three cycles of irinotecan plus etoposide and pelvic floor radiation. He then refused all treatment and requested supportive management and home care. He passed away in February 2018. Primary neuroendocrine prostate cancer is seen in around 1% of cases, whereas some degree of neuroendocrine phenotype is seen in 25%–30% of metastatic castrate-resistant prostate cancers. Treatment-related NEPC is a relatively new term for prostate cancers which were initially diagnosed as adenocarcinoma of the prostate, and which after receiving hormone therapy differentiate into neuroendocrine histology. Cytokines and androgen withdrawal may stimulate neuroendocrine differentiation. These tumors have an aggressive clinical course and do not respond to androgen receptor-targeted therapy. The median cancer-specific survival of neuroendocrine prostate cancers is around 2 years. They usually involve visceral organs and have a lower PSA than expected. Patients with obstructive symptoms may require transurethral surgery. Such instrumentation may lead to implantation of cancer cells in the urethra. The present case shows both these peculiar findings: a transurethral instrumentation likely leading to implantation of tumor in the urethra and a probable differentiation of adenocarcinoma of the prostate to a neuroendocrine variety. To the best of our knowledge, this is the first reported case of a urethral metastasis bearing a neuroendocrine histology probably after a differentiation of the primary tumor. As the bladder neck was open on cystoscopy, we did not biopsy the prostate. This is a limitation in the narrative of this patient. If a prostate tumor is growing despite therapy with the PSA being low, one should suspect a neuroendocrine differentiation. This leads us to raise the question of whether a serial serum chromogranin A level as suggested by some should have been monitored along with a serum PSA level for such a case. The utility of such an exercise is still open to debate. Beltran H, Tagawa ST, Park K, MacDonald T, Milowsky MI, Mosquera JM, et al. Challenges in recognizing treatment-related neuroendocrine prostate cancer. J Clin Oncol 2012;30:e386-9. Epstein JI, Amin MB, Beltran H, Lotan TL, Mosquera JM, Reuter VE, et al. Proposed morphologic classification of prostate cancer with neuroendocrine differentiation. Am J Surg Pathol 2014;38:756-67. Shen R, Dorai T, Szaboles M, Katz AE, Olsson CA, Buttyan R, et al. Transdifferentiation of cultured human prostate cancer cells to a neuroendocrine cell phenotype in a hormone-depleted medium. Urol Oncol 1997;3:67-75. Chang CC, Kuo JY, Chen KK, Lin AT, Chang YH, Wu HH, et al. Transurethral prostatic resection for acute urinary retention in patients with prostate cancer. J Chin Med Assoc 2006;69:21-5. Kobayashi T, Fukuzawa S, Oka H, Fujikawa K, Matsui Y, Takeuchi H, et al. Isolated recurrence of prostatic adenocarcinoma to the anterior urethra after radical prostatectomy. J Urol 2000;164:780.